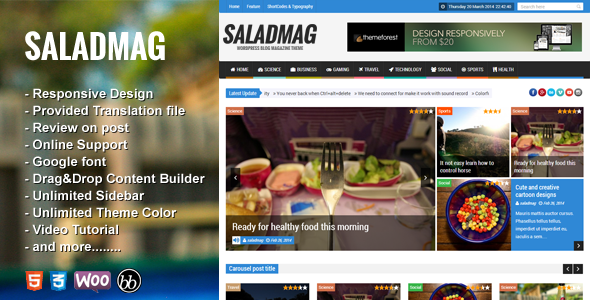 NanoMag is a Premium WordPress Magazine Theme that clean and fully responsive layout. This theme is useful with Drag&Drop Content Builder, theme options, review system, custom sidebar and much more! Bought theme because of the looks. But boy oh boy does it have some crappy coding. -part of the theme uses JS for responsiveness These is just what I found in couple of days work ( I do require some customization). Using child theme is super impractical, because I literally need to change code in parent. Worked on more then 1 theme from themeforest before and never seen such a poor code standards. Its a shame for author and themeforest. I bought the template and installed it. I got some problem and things i need solution for. I sent mails to the author but he doesnt help at all. Each simple thing i ask him about, he act like he didnt understand nothing. Each mail need more than a day and half at least to get answer. Dont recommend at all, although the template is really nice. Shows many customization options, and there is absolutly no way I can find out how to customize it by myself. I’m finghting to try to discover how to change the front page sliders for HOURS and it’s impossible. There is no documentation to help. Absolutly don’t recomend. Sekolah is modern and fresh design template for School/Education template. Design to fit for Senior or Junior High School. This theme including schedule, academic calendar, school event, school excursion, teacher page, blog page and also gallery page.